Carnivor Zinfandel is a captivating combination of full-bodied flavours and elegant spice. Bold notes of dark cherry and blackberry jam complement hints of mocha and toasted oak. Carnivor Zinfandel's rich flavours end with a plush, smooth finish. 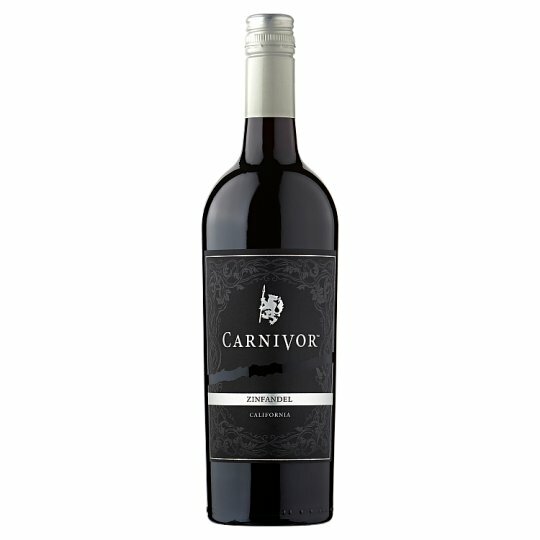 Carnivor Zinfandel is juicy, bold, big and flavourful, featuring hints of spice with a smooth touch for a complete palate. Intense dark fruit flavours of blackberry, plum and boysenberry are matched with notes of mocha, dark chocolate, black pepper and baking spice. Flavours of vanilla and toasted almond linger with a long, smooth finish. Following a brief cold soak to encourage extraction of colour and tannin from the fruit, the must was fermented between temperatures of 88-90°F. The wine was then aged on French and American oak until the tannins were softened and the wine structure was balanced. We blended Cabernet Sauvignon grapes to enhance the wine's colour and structure, and Merlot to give this wine a soft mouthfeel. Carnivor wines never compromise. For those who don't just live life, they Devour Life, Carnivor is a sophisticated wine with bold flavours that are matched by a refined smoothness. We selected a large portion of the fruit for our Zinfandel from premier vineyards in Lodi. A leading California wine growing region for over 150 years, Lodi first earned its high-quality wine reputation from the robust, fruit-forward and exceptionally well-structured Zinfandel grown there. The warm days and cool nights of Lodi's Mediterranean climate are ideal conditions for growing intensely ripe grapes while still retaining signature acidity and structure.